In this part of the tutorial, you'll make some improvements to the automatically generated Details and Delete methods. These changes aren't required, but with just a few small bits of code, you can easily enhance the application. When you scaffolded the Movie controller, ASP.NET MVC generated code that worked great, but that can be made more robust with just a few small changes. Open the Movie controller and modify the Details method by returning HttpNotFound when a movie isn't found. You should also modify the Details method to set a default value for the ID that's passed to it. (You made similar changes to the Edit method in part 6 of this tutorial.) However, you must change the return type of the Details method from ViewResult to ActionResult, because the HttpNotFound method doesn't return a ViewResult object. The following example shows the modified Details method. Code First makes it easy to search for data using the Find method. An important security feature that we built into the method is that the code verifies that the Find method has found a movie before the code tries to do anything with it. For example, a hacker could introduce errors into the site by changing the URL created by the links from http://localhost:xxxx/Movies/Details/1 to something like http://localhost:xxxx/Movies/Details/12345 (or some other value that doesn't represent an actual movie). If you don't the check for a null movie, this could result in a database error. Similarly, change the Delete and DeleteConfirmed methods to specify a default value for the ID parameter and to return HttpNotFound when a movie isn't found. The updated Delete methods in the Movie controller are shown below. Note that the Delete method doesn't delete the data. Performing a delete operation in response to a GET request (or for that matter, performing an edit operation, create operation, or any other operation that changes data) opens up a security hole. For more information about this, see Stephen Walther's blog entry ASP.NET MVC Tip #46 — Don't use Delete Links because they create Security Holes. To sort this out, you can do a couple of things. One is to give the methods different names. That's what we did in he preceding example. However, this introduces a small problem: ASP.NET maps segments of a URL to action methods by name, and if you rename a method, routing normally wouldn't be able to find that method. The solution is what you see in the example, which is to add the ActionName("Delete") attribute to the DeleteConfirmed method. This effectively performs mapping for the routing system so that a URL that includes /Delete/for a POST request will find the DeleteConfirmed method. 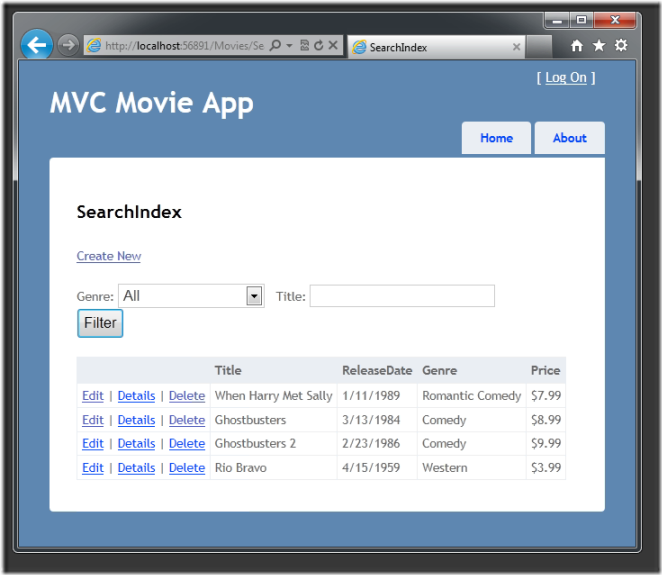 You now have a complete ASP.NET MVC application that stores data in a SQL Server Compact database. You can create, read, update, delete, and search for movies. This basic tutorial got you started making controllers, associating them with views, and passing around hard-coded data. Then you created and designed a data model. Entity Framework Code First created a database from the data model on the fly, and the ASP.NET MVC scaffolding system automatically generated the action methods and views for basic CRUD operations. You then added a search form that let users search the database. You changed the database to include a new column of data, and then updated two pages to create and display this new data. You added validation by marking the data model with attributes from the DataAnnotations namespace. The resulting validation runs on the client and on the server. I now encourage you to move on to our intermediate-level Creating an Entity Framework Data Model for an ASP.NET MVC Application and MVC Music Store tutorials, to explore the ASP.NET articles on MSDN, and to check out the many videos and resources at https://asp.net/mvc to learn even more about ASP.NET MVC! The ASP.NET MVC forums are a great place to ask questions.